Three nights spent in Da Lat, then a three hour drive down from the mountains to Nha Trang on the coast, where we stayed for three nights. I’ll be honest, it took a couple of days for our backsides to recover from the beatings they got on the bikes last week, so there was a lot of resting in Da Lat. But once we emerged from our rather glorious homestay room (see info on Villa Vista under what to eat in Da Lat below), we were quite charmed by the place. It has a heavy dose of European chic and looking down on it from one of the vantage points, you could almost be in a colourful Alpine town. 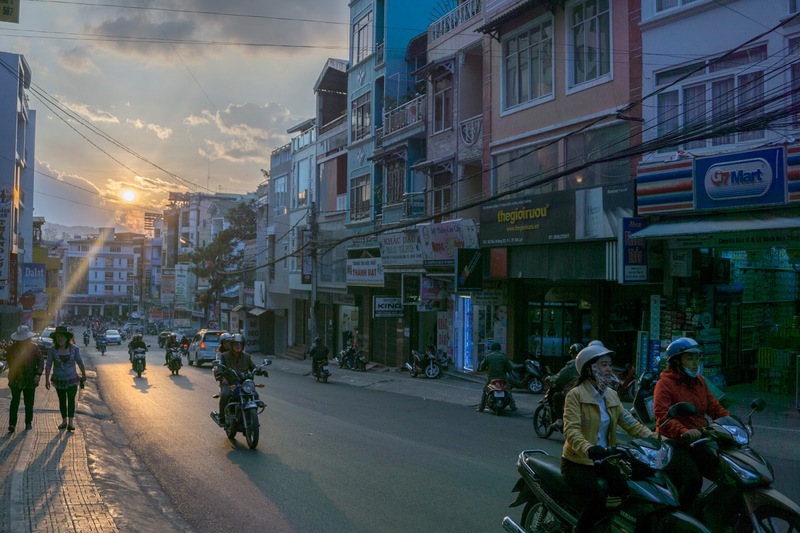 It’s a mid-sized city at around 1500-2000m above sea level, quite hilly with sloping streets, and people come here for respite from the scorching temperatures of the lowlands of Ho Chi Minh City and the like. It’s surrounded by pine-covered hills, lakes and even higher peaks, providing a lot of prettiness to look at. 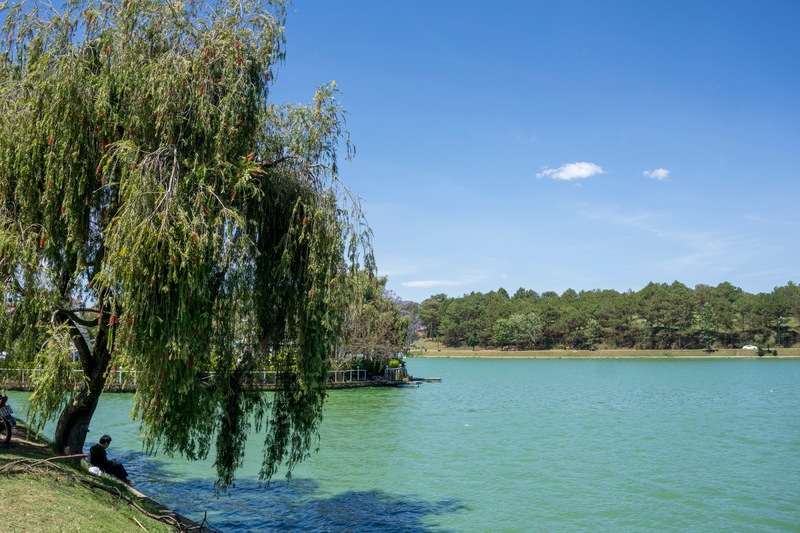 If you intend to visit, give yourself an extra couple of days to take day trips out beyond the city to the nearby surrounding greenery, waterfalls and the likes of Lak Lake. 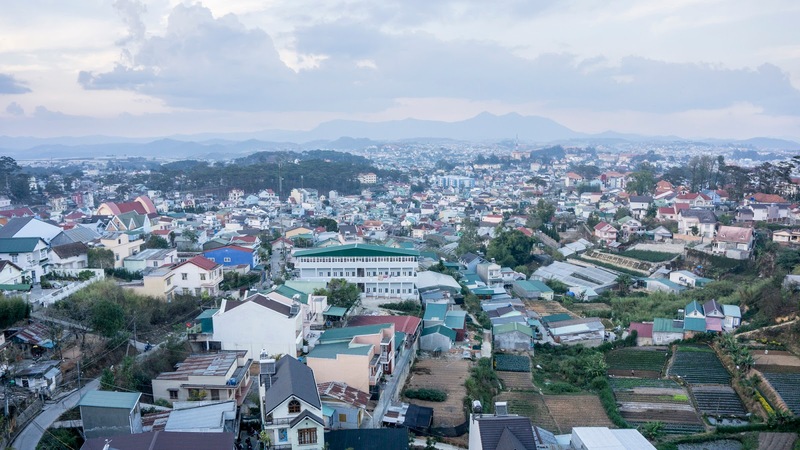 The fertile soil makes Da Lat one of Vietnam’s most productive agricultural areas, producing fruits, vegetables, tea, coffee beans and flowers that simply will not grow in the stifling heat closer to sea level. Coming into Da Lat by road, you’ll pass huge expanses of polytunnels and plastic greenhouses, sheltering thousands of acres of brightly coloured blooms that reach markets as far north as Hanoi. And then there is Nha Trang. You know you’re in a tourist hotspot when the menus are in Vietnamese, and Russian; we must have missed the Welcome to Moscow-on-Sea sign on the drive in. It turns out Vietnam Airlines fly directly from Nha Trang to Russia, three times a day(! ), so understandably, many Russians choose to spend two weeks warming their bones under the town’s gorgeous skies. It didn’t take long for the locals to realise Russians aren’t shy of a bob or two, and so many have tailored their food and services for this customer base. There is, of course, nothing wrong with Russians. But too many tourists of any kind, in any location, can quickly get tiresome. 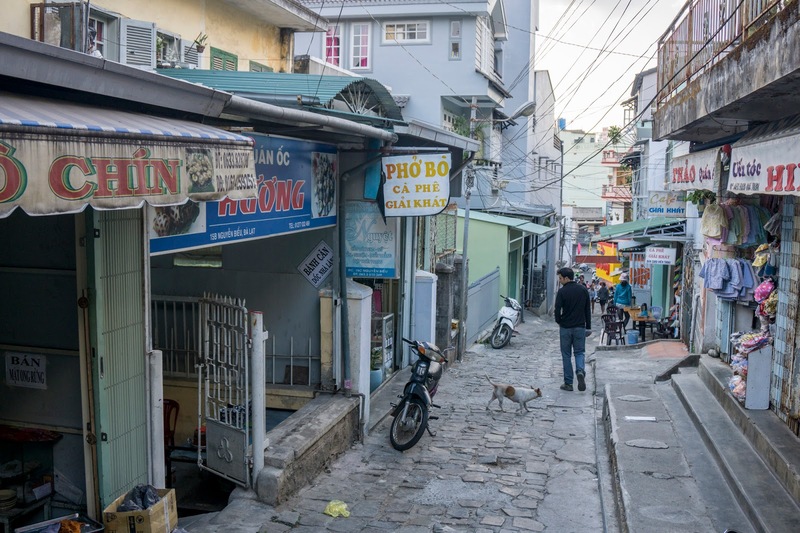 Thankfully, it’s very possible to get out of the sunshine Soviet and back into local Vietnamese culture – just move away from the beach. 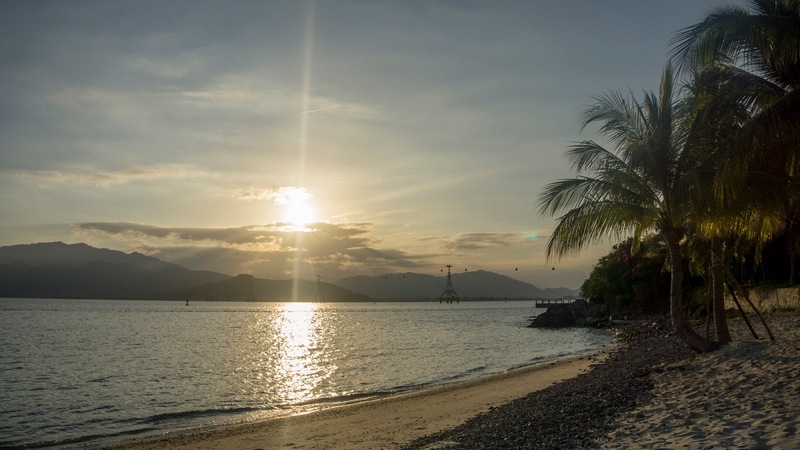 Whilst a lot of Nha Trang isn’t exactly typical Vietnam, I’d say it’s still worth a stop for a couple of days between the highlands and heading on southwest to HCMC (a comfortable overnight train will take you there – see next week’s post). But I’d probably choose not to visit during holiday season – Christmas, New Year’s, Easter, summer holidays etc. 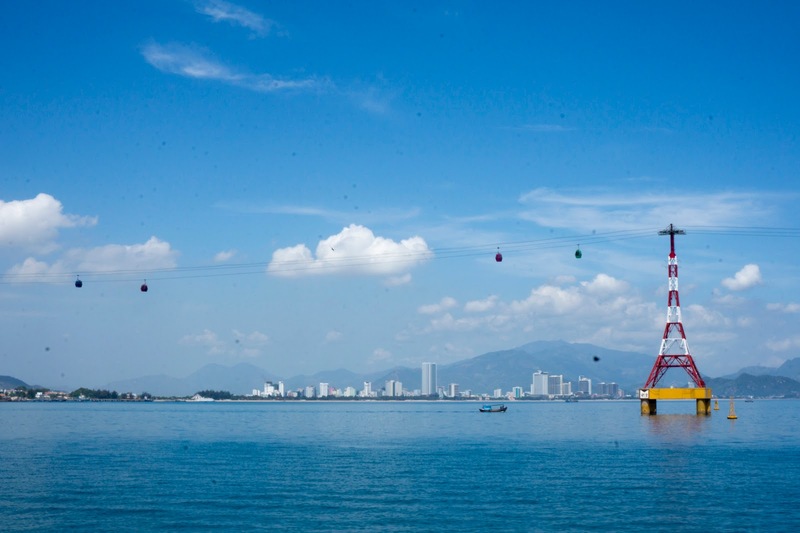 You can get the longest over-water cable car in the world to Vinpearl Land for the day, where they have an amusement park, water theme park, aquarium, indoor games arcade, and more. And when were water parks ever not fun. 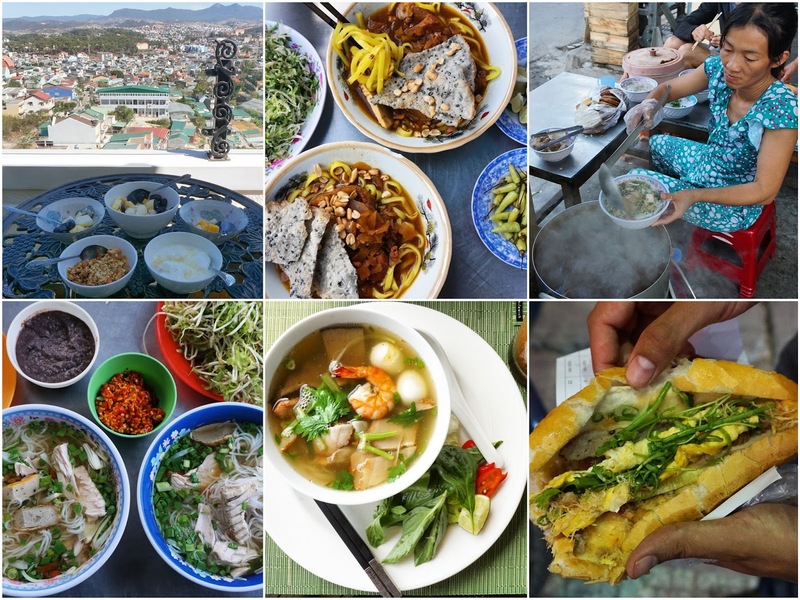 What to eat in Da Lat..
Breakfast, Villa Vista Homestay. After six days eating meat and rice at least twice a day last week, this breakfast (and its fibre content) was so very welcome. Tim from Australia and his Vietnamese wife Huong run Villa Vista homestay at the top of the hill in Dalat (gorgeous room and great value, by the way). To start off each morning’s spread, homemade granola with coffee flower honey, dried mango and banana, and rum and raisen chocolate pieces from Hokkaido, Japan. Also, homemade yoghurt cultured from Indian yoghurt, a load of fresh fruit, and a pretty great view. 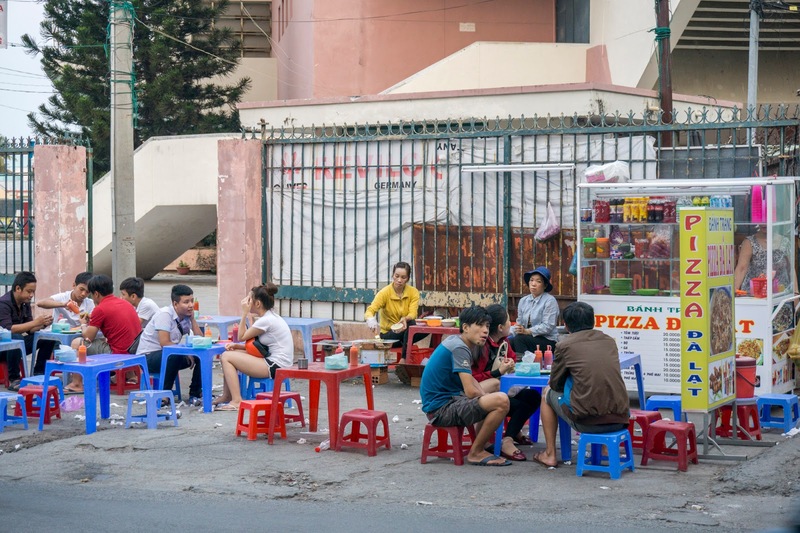 Mì quảng, Mì Quảng Thành, 58C Phan Đình Phùng Street. I also tried this in Hoi An. It’s a central dish that’s popular up in the mountains too. In these parts, it comes with great meaty slow cooked pig trotters. Still with the thick turmeric-stained noodles and sesame rice cracker. 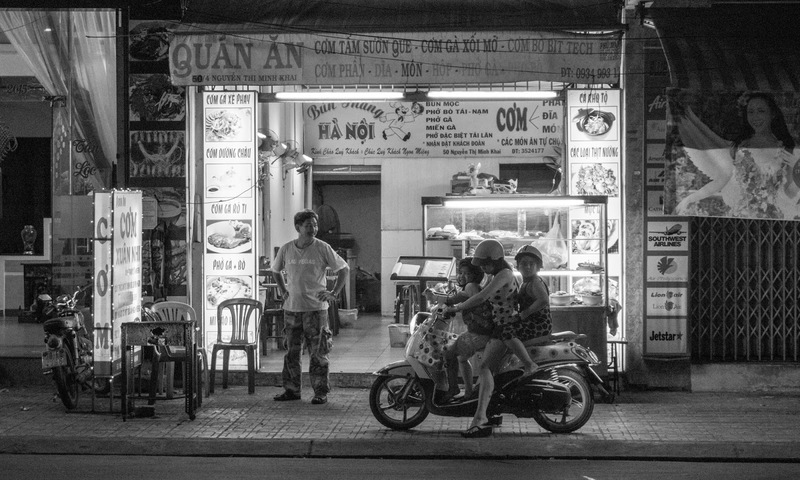 What to eat in Nha Trang.. 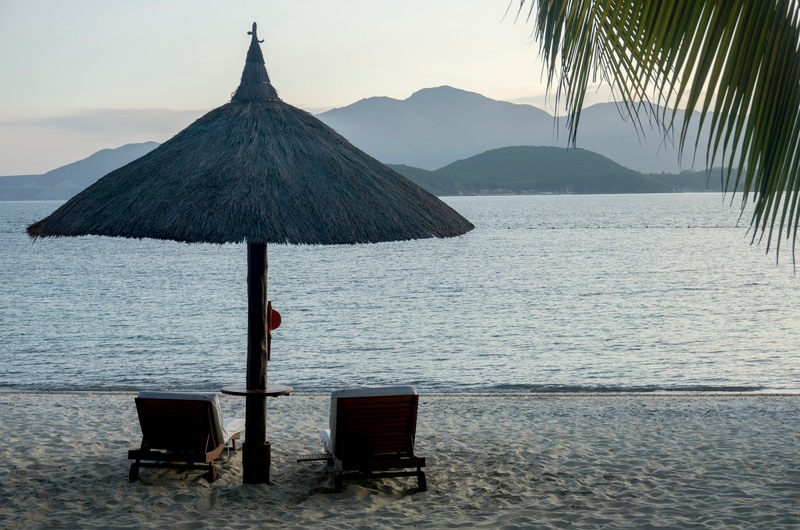 It is possible to avoid the overpriced tourist fodder that is everywhere in Nha Trang. Unsurprisingly, the good places to eat tend to be away from the beach. The below will set you off on the right foot. Bún cá sua, Bún Cá Sứa 87 Yersin. 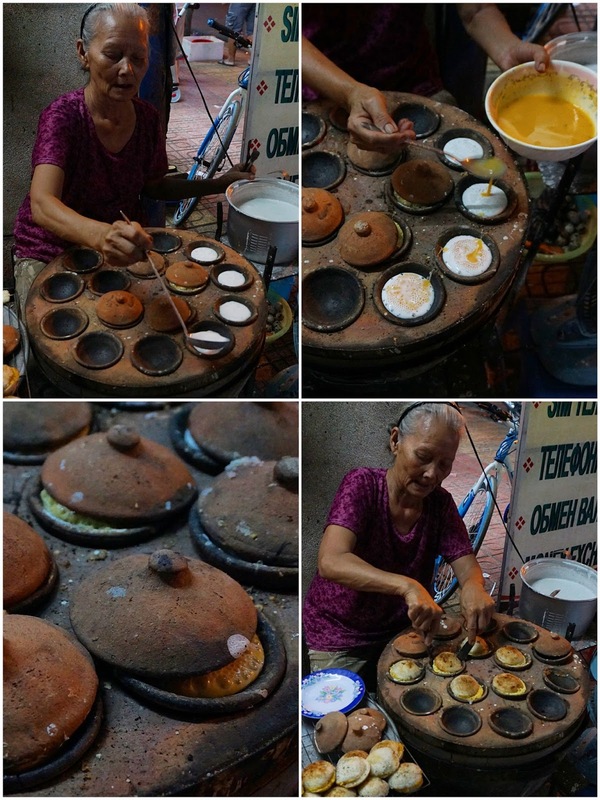 This lady served us a couple of steaming bowls of bún cá sứa, native to Nha Trang. It’s a delicate fish bone broth with tomatoes, rice vermicelli, hunks of meaty white local fish and fried fish patties. It’s also supposed to have fresh jellyfish in, and there was a bowl there, but I don’t believe she included them; she probably assumed we wouldn’t like them because we’re tourists. Which is a shame. I still really enjoyed this though. Hu tieu, Intercontinental Hotel Nha Trang. A noodle soup dish of the south, particularly the Mekong Delta. There are loads of local variations making the most of whatever ingredients are available. Key elements: pork-based broth, ground pork, Chinese celery, garlic, shallots. Here also with shrimp and quails egg. Bánh mi, a cart. We stumbled across this guy where the streets Nguyen Thien Thuat and Nguyen Thi Minh Khai cross. This is the ubiquitous Vietnamese baguette stuffed with all manner of good things. They can be found everywhere, but only some do them really well. This stall holder was particularly busy, customer after customer turning up on mopeds to whisk a couple of stacked sandwiches away. At his disposal: paté, steamed sausage, butter, chillies, eggs, cheese, herbs, pickles, shrimp sauce, meat floss, more. The eggs were cooked by a lady on a single gas burner in a cabinet just underneath the main assembly area. I asked for one with everything, obviously. Street food in Da Lat..
Bánh tráng, Ms Tâm by Xuan Huong lake. This is often referred to as the Da Lat pizza, which is how you might see it marketed outside places that make them. 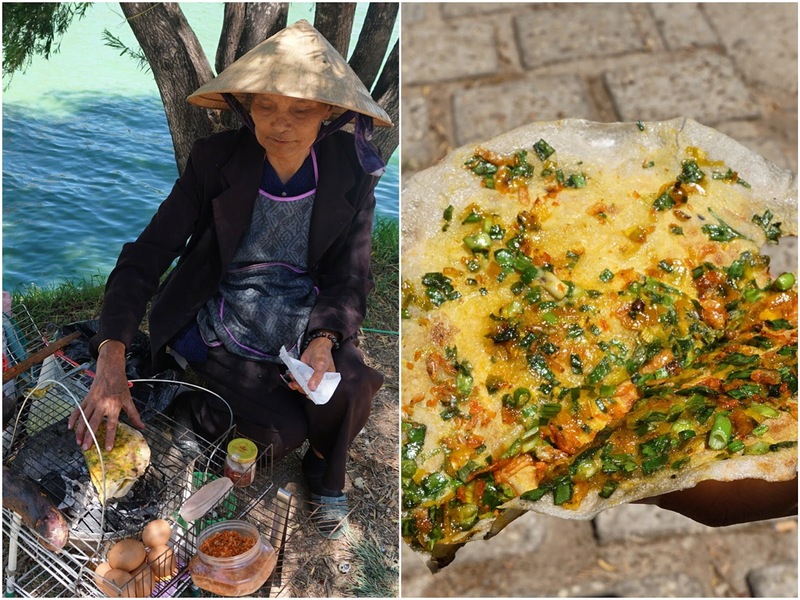 It’s in fact a paper thin circle of rice paper with a flourish of colourful and tasty toppings, grilled over coals until really crisp. Ms. Tam accessorises hers with quail eggs, spring onions and tiny shrimp. About 30p each. Great to fill the gap between walking from one side of the lake to the other. 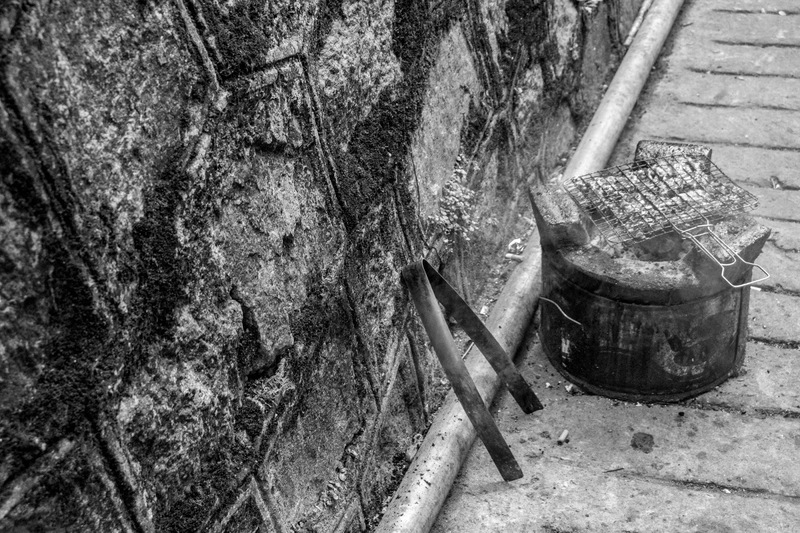 Street food in Nha Trang..
1) Pour rice flour and water batter into round metal pods over hot coals. 2) Add a spoonful of beaten quails egg to the middle of each. 3) Put lids on and let them cook until crisp on outside and fluffy inside. 4) Tease these browned beauts out of their moulds. Awards. 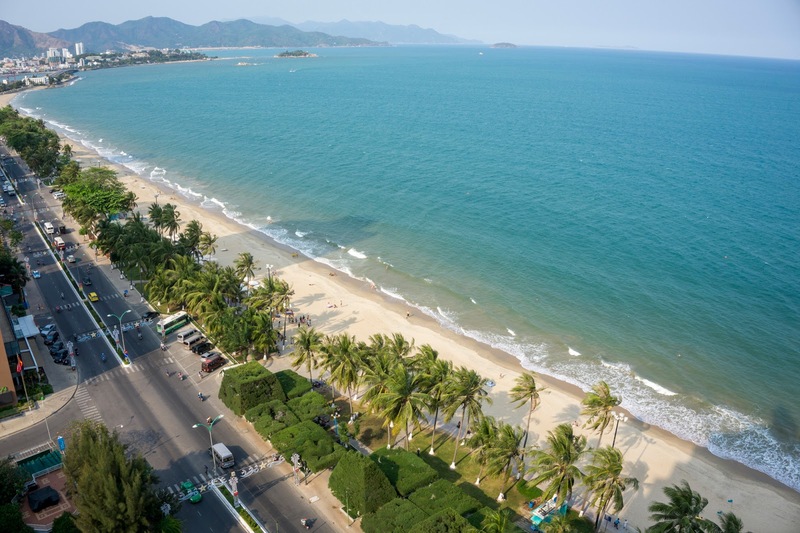 Nha Trang Bay has been acknowledged by Travel and Leisure as one of 29 most beautiful bays in the world for two consecutive years. Drive from Da Lat to Nha Trang. You can get a local taxi to take you all the way, just settle on a cost beforehand rather than having the meter running – your hotel will be able to call one for you. 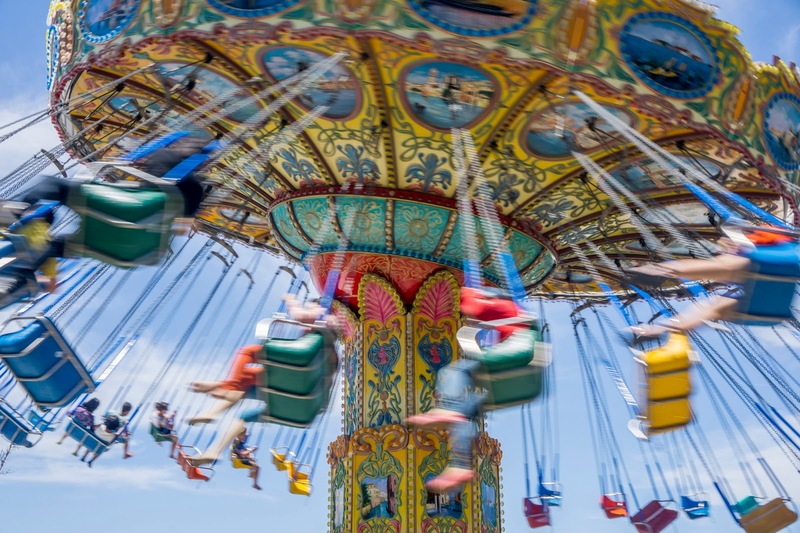 It was around $50 for a 7-seater at this time of year, and it takes around three hours. It’s quite a winding route down from the mountains, so if you’re partial to getting travel sick from all the tight bends (as we do), best to opt for a private car than sitting on the back of a bus swinging from side to side. Barf. Highlight. Getting to be beach bums for a couple of days. Long overdue, especially after last week’s endurance test on the motorbike. Also, the one night we spent at the pretty posh and exclusive Vinpearl Luxury resort (here’s my full review of Vinpearl Luxury), complete with villa and private, pristine beach. So that was nice. Lowlight. The soft bit (bag area) under Matt’s left eye has been twitching non-stop for two months now, and although he can’t feel it, it’s really starting to annoy him. Said to be a symptom of tiredness/stress (and watching Spurs), the resident onsite doctor at Vinpearl which he made use of, said what everyone else said – he needs to sleep. We read somewhere that quinine (found in tonic water) can sometimes stop it, so he’s been stocking up on cans, letting them go flat (he doesn’t like fizzy drinks), filling empty water bottles with the stuff, and disguising the frankly disgusting taste (when there’s no gin) by adding a load of iced tea powder. He’s then carrying these heavy bottles around with him every time we move hotel / location, sipping from them and wincing at the taste each time. Doesn’t seem to be making any difference, so far. In other news, I’m really missing London in the spring time. It’s my favourite time of year, and I can easily while away hours looking over the new buds and shoots emerging from seemingly dead twigs in my garden. And the magnolias! How I miss the magnolias. It’s week 11, and I may be a touch home sick. Our final overnight train in Vietnam from Nha Trang to Ho Chi Minh City (aka HCMC, formerly Saigon) for a few nights. Then a two day tour through the Mekong Delta, returning to HCMC for another couple of nights, before we say so long to Vietnam *wipes a tear*. Amazing blog! 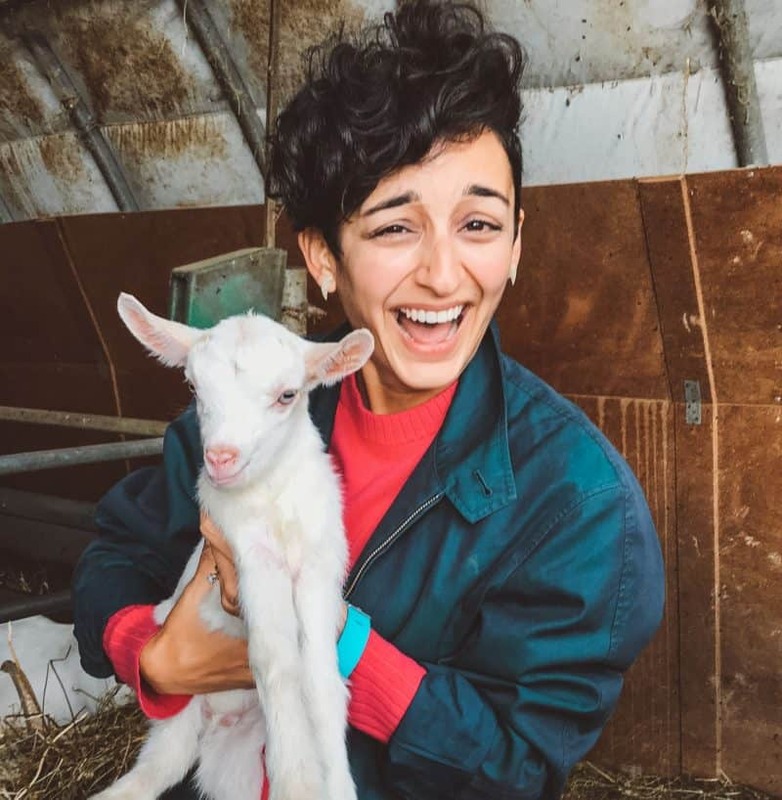 I love these photos in this post. I’m quite curious about the city you like most in the trip to Vietnam since I see you have spent nearly 3 weeks in our country. Nice post, i really enjoyed the food part would like to visit their at once.